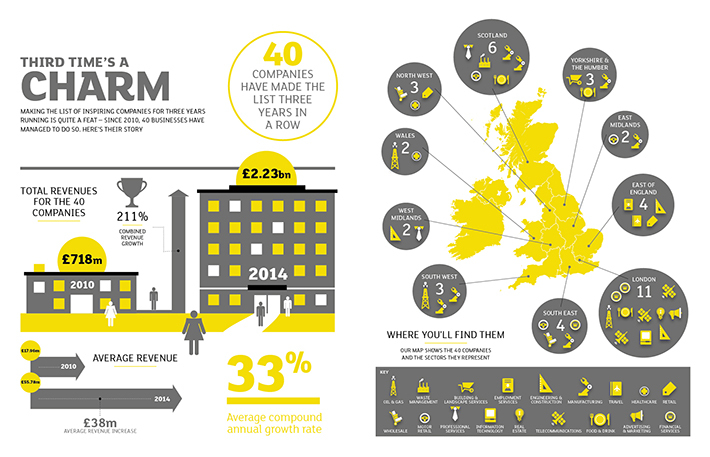 With the right tools and ability to innovate, companies from all sectors and regions of the UK can thrive. The companies in this section, representing an array of industries, have each appeared on our list three times. That’s quite a feat. All the companies in this book have exhibited impressive growth in a still recovering economy. The companies in this section particularly stand out, however. They cover a cross section of industries and have each displayed exceptional growth for a number of years. On top of that, They have consistently outperformed their sector peers. That’s why they have made the list for the third year in a row. CHI & Partners delivered Argos’s 2015 Christmas campaign, as well as British Gas’s animated 2015-16 winter campaign. Originally a small boutique, Childrensalon now sells items by nearly 300 of the world’s top fashion brands. From Thai to Turkish, digital marketplace Just Eat delivers diverse cuisine from 59,000 restaurants. Tom Hartley specialises in luxury performance and classic cars that are often unobtainable from anywhere else for direct delivery.